Democrats Are Asking Two Sandy Hook Parents to Run for Congress. It’s Not an Easy Decision. Here’s what Nicole Hockley and Mark Barden would have to leave behind. Nicole Hockley and Mark Barden are best friends. Both lost young sons on one of the most violent days in recent US history. Both have spent the past five years working to stop gun violence and improve school safety. And next week, they’ll announce whether one of them will be running for Congress. Hockley’s son, Dylan, and Barden’s son, Daniel, were among the 26 children and staff murdered at Sandy Hook Elementary School in Newtown, Connecticut, on December 14, 2012. 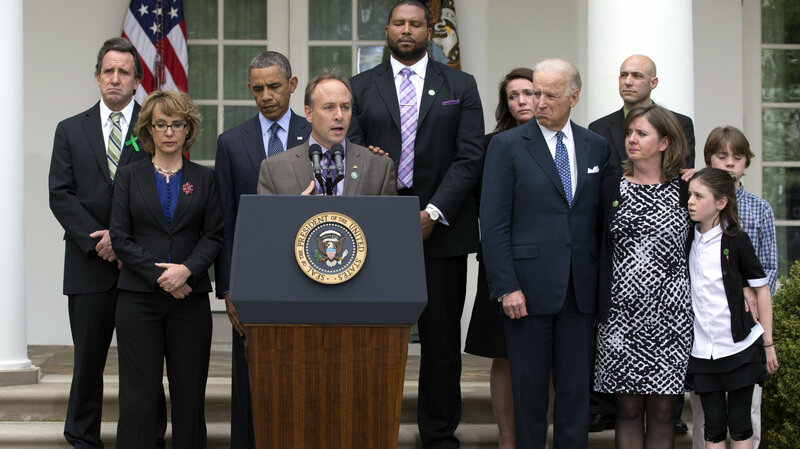 In the wake of that tragedy, they’ve tirelessly worked for gun reform and safer schools as the leaders of Sandy Hook Promise, a grassroots organization that trains educators, students, and parents to identify the signs of violence and intervene before it occurs. Their high-profile activism recently caught the attention of the Democratic Congressional Campaign Committee, which asked if either of them would consider a run for Congress in Connecticut’s 5th district, which includes Newtown. The seat abruptly opened up this month when the incumbent, Democrat Elizabeth Esty, announced she would not seek reelection. Esty’s decision followed reports that she’d continued employing her chief of staff, and recommended him for a job with Sandy Hook Promise, after learning he had allegedly threatened a former staffer’s life. In the days since the DCCC reached out, Barden and Hockley have been consulting with party leadership in Connecticut and Washington, and the two activists say they are in the process of deciding between themselves who might be best suited for elected office. They’ve already made one key decision: They won’t run against each other—just one, or perhaps neither, will join the race. If either of them does announce a run next week, they would enter a midterm election that has already been shaped to an unusual extent by the gun debate. But as they weigh the possibilities of acquiring policy-making powers, both are thinking carefully about what they’d leave behind—a partnership and a legacy of nonpartisan activism that has made progress where Congress often could not. Barden speaks at the White House after the Senate rejects gun control legislation in 2013. Barden’s wife, Jackie, and their surviving their children, Natalie and James, are to the right of former Vice President Joe Biden. Hockley is to Biden’s left. For half a decade, Barden and Hockley have been driving forces behind a movement that was born out of the tragedy that took their children’s lives. Sandy Hook Promise—along with Shannon Watt’s Moms Demand Action, Michael Bloomberg’s Everytown for Gun Safety, and former Rep. Gabrielle Giffords’ foundation—provided much of the policy and organizing expertise behind the outburst of activism that followed February’s school shooting in Parkland, Florida. Unlike many of its allies, Sandy Hook Promise has built an unusual reputation for transcending political divides. While less focused than some of its partner organizations on firearms restrictions, the group has supported tougher background checks and federal funding for gun violence research, as well as mental health and criminal justice reform initiatives. Since its founding, it’s helped pass two pieces of federal legislation aimed at improving the climate in schools. It was the only gun safety organization present at a White House event in February that brought together survivors and families affected by shootings. They also share a depth of knowledge on the subject and a knack for breaking down complex policy into layman’s terms—skills honed over years as reluctant experts on gun violence. Hockley’s talents were on full display during her trip to Washington this week, when she shared Sandy Hook Promise’s achievements with a school safety forum hosted by Florida Sens. Bill Nelson (D) and Marco Rubio (R). “To move away from that cerebral world to a policy world—it’s hard,” Hockley says. And Barden and Hockley know first-hand just how hard that policy world can be. In 2013, they lobbied for federal legislation that would have expanded background checks on gun sales and banned some semi-automatic weapons. The bill failed five years ago this week, unable to garner the 60 votes needed to break a Senate filibuster. Since the Sandy Hook shooting, no significant gun control legislation has passed Congress. It was the 2013 setback that convinced Barden and Hockley to focus their school safety work on areas where they could have a more immediate impact. So why think about another change in course now? For Barden, it’s about putting the tragic circumstances to productive political use in an effort to fix Congress from the inside. “I think my particular life experience, and then subsequent education, would lend itself well to that kind of work,” he says. 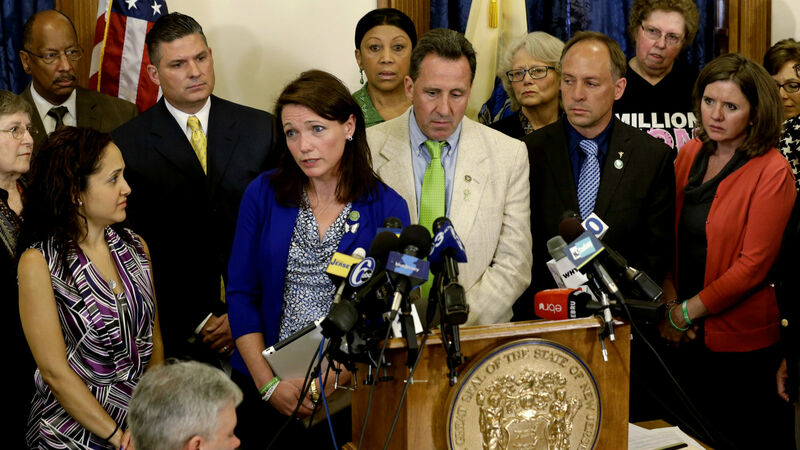 Hockley, Barden, and other Sandy Hook parents ask New Jersey lawmakers to limit ammunition magazines to 10 bullets in 2013. The question became impossible to ignore in 1996, when her representative in Congress, Republican Dan Frisa, voted to repeal the 1994 federal ban on assault weapons. (The repeal effort failed.) To McCarthy, Frisa’s vote wasn’t simply wrong-headed, but also dishonest—she says he’d promised her he’d vote the other way. She had traveled to Washington for the vote, and when she saw what he’d done, she emerged from the Capitol full of rage. A local New York reporter caught up with her to ask if she’d consider a run for Congress. “I said, ‘You know what? I just might think about that,’” she recalls. It wasn’t an easy decision. McCarthy had been successful in her advocacy efforts—she had worked alongside President Bill Clinton to pass the assault weapons ban in the first place. Her young adult son, Kevin, still suffered from complications related to his gunshot wounds; as a widow, she was his sole caregiver. And the introverted McCarthy, who had worked as nurse before her husband’s death, felt she didn’t have the experience or skills necessary to run for political office. The advice she received from other Democratic officials was less helpful. “The party came in and said, ‘You gotta learn this, you gotta do that,’” McCarthy says. “I just looked at them and said, ‘No, I’m running on this issue! This is the issue!’” In the end, she defeated Frisa by 16 points. She held office for 18 years. Like McCarthy and McBath, Barden and Hockley have found plenty of people who eager to dispense political wisdom. The Connecticut Mirror reported that House Minority Leader Nancy Pelosi (D-Calif.) called Barden and encouraged him to run. He says he’s consulted several times with Esty and Sen. Chris Murphy (D-Conn.), who had held Esty’s seat before joining the Senate and has been a leading advocate for gun control. Barden says those two in particular have helped him understand how this decision would affect his life. “I keep hoping somebody will say, ‘Here’s what you need to do and here’s why,’ but of course, they say, ‘You need to make the decision that’s right for you,'” Barden says. This Gun Control Advocate Hoped to Win a Seat in the Statehouse. After Parkland, She’s Thinking Bigger.